The world is a devastated, poisoned place, full of terrible diseases and monstrous creatures (and creations). 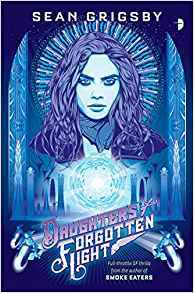 The Vanishers came, enslaved and changed the world – and then disappeared, leaving the world even more broken in their wake. Failed scholar Yên is the daughter of her vil­lage’s only healer. She’s her mother’s only child, but to the village elders, she’s barely useful. When her mother invokes a powerful spirit – a dragon – to save the seriously ill daughter of one of the village elders, the village elders decide that Yên will pay the dragon’s demanded price, rather than her more useful mother or the more valuable pa­tient. Everyone knows that dragons kill, and when she’s traded away to the dragon, Yên expects to be tortured and killed for the dragon’s amusement. Vu Côn is one of the last dragons walking the earth, and she knows all too well that everything has a price. She has a use for Yên: she needs a scholar to tutor her headstrong children, impul­sive, over-certain Liên and quiet, worried Thông. Vu Côn wants them to have more care for tradi­tions and respect than she can bring herself to have, and for that she needs a scholar, someone who cares about such things as more than a duty. Vu Côn has duties of her own – Vu Côn has pa­tients, for she has dedicated herself to healing the ill, those who come to her ravaged by diseases that the Vanishers let loose. She dwells in a building that the Vanishers made, because there is no other place better suited to her purposes, but the Vanish­ers’ palace is a terrifying, vertiginous structure, where doors can open from the horizontal to the vertical, windows can look out beneath one’s feet, and any corner could conceal death. She brings Yên back to this palace, and at first Yên is terrified – intimidated by her surroundings and by the dragon who’s both master and jailer. But as time wears on, she begins to see a softer, more compassionate side – and finds herself wrestling with an impossible attraction to the other woman. It’s an attraction that’s reciprocated, though Vu Côn knows nothing can ever come of it – for one thing, it would be wrong to exploit the power imbalance between them. Worse, Vu Côn soon realises that Yên is changing – that some virus is altering her, giving her access to magic but also killing her slowly. She thinks she can fix it without telling Yên, but Vu Côn has to reassess quite a few of her assumptions when her secrets (and those of her children) are explosively revealed. Betrayed, sick near to death, and des­perately unhappy, Yên has to choose where her happiness lies – and Vu Côn has to accept that her knowledge of what’s best for people has limits. 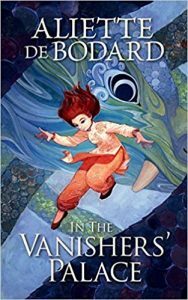 Though In the Vanishers’ Palace is set in a new continuity, its worldbuilding shares the same deft, complicated vibrancy as de Bodard’s Xuya stories and the “Dominion of the Fallen” series. The world and the characters are drawn in sharp relief, and In the Vanishers’ Palace has a precision and intensity about its characters and the relationships between them that gives a striking, edged realism to its emotional arcs. And in a pleasing touch, nonbinary characters are part of the world (two have a prominent role to play) and queerness is an unmarked state. 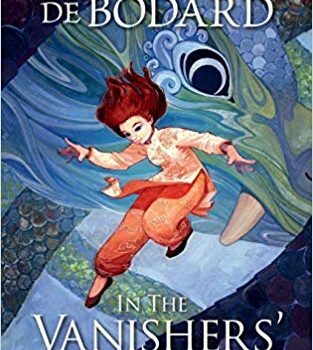 De Bodard has referred to In the Vanishers’ Palace as a “dark retelling of Beauty and the Beast.” The Beauty and the Beast parallels are obvious, including the filial loyalty that sends a daughter into the power of a “beast” in order to preserve her parent. Worldbuilding aside, though, while In the Vanishers’ Palace may be wrench­ing, in narrative and emotional terms, it’s a lot kinder than it is dark. Its characters care despite themselves, and most of them, most of the time, act with good intentions (though sometimes good intentions result in poor outcomes). This is a compelling short novel, with vivid and fascinating characters. (It’s so compelling, in fact, that every time I went back to it while writing this review to check a spelling, I found myself car­ried away for pages on end before I could recall myself to my work.) For me, it’s an utter delight: a really enjoyable, polished and gleaming jewel of a story. I sincerely hope de Bodard returns to these characters and to this world.